The Navy is continuing operational testing of its future unmanned long-endurance maritime surveillance aircraft, the MQ-4C Triton, demonstrating its ability to share critical mission information with the manned P-8A Poseidon multi-mission maritime patrol aircraft. During a June 2 flight test at Naval Air Station Patuxent River, Md., a Triton successfully exchanged full-motion video with a Poseidon for the first time via a Common Data Link system, Naval Air Systems Command announced today. The test demonstrated the Triton’s ability to track a surface target with its electro-optical/infrared (EO/IR) camera to build situational awareness for a Poseidon crew flying many miles away, further establishing the interoperability of the two aircraft that will be essential to their combined mission of controlling vast areas of ocean. “In an operational environment, this would enable the P-8 aircrew to become familiar with a contact of interest and surrounding vessels well in advance of the aircraft’s arrival on station,” Cmdr. Daniel Papp, Triton integrated program team lead, said in the NAVAIR news release. 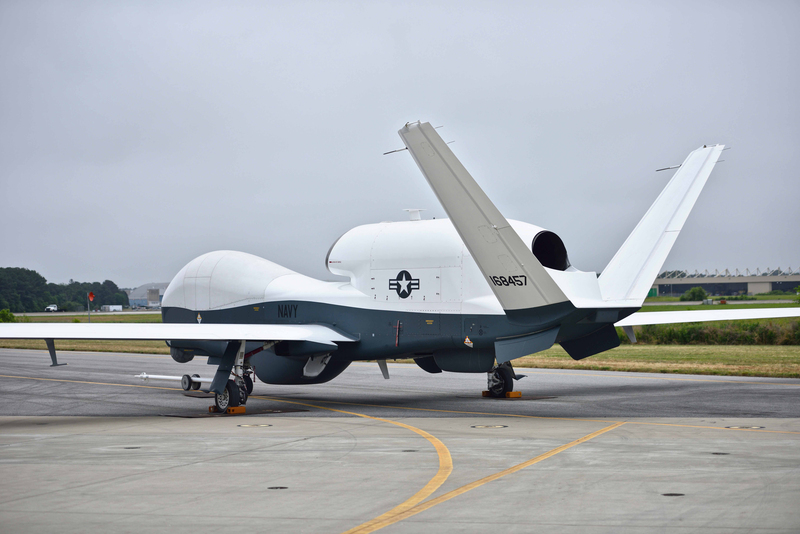 Separately, the Triton test aircraft also has conducted a series of heavy weight flight tests that will expand significantly the UAVs’ expected time on station by flying at higher altitudes with a full load of fuel, the NAVAIR statement added. In separate tests, the Triton flew the heavy load to 20,000 and then 30,000 feet altitude. The program will continue the heavy weight tests up to the Triton’s top operational altitude of 60,000 feet, NAVAIR spokeswoman Jamie Cosgrove told USNI News. The Triton, a heavily modified version of the Air Force’s RQ-4C Global Hawk, is a product of the Navy’s Broad Area Maritime Surveillance (BAMS) program. It is designed to fly at very high altitudes for up to 24 hours, covering thousands of miles of ocean with its AN/ZPY-3 radar, tailored for overwater reconnaissance; its EO/IR sensors; and an Automatic Identification system that monitors the required recognition signals from commercial ships. By scouting large areas, the unmanned aircraft can allow the manned P-8s to fly only when its capabilities are needed. Triton and Global Hawk are both produced by Northrop Grumman. The BAMS program calls for buying 69 operational aircraft to team with 117 P-8s, replacing 196 of the aging P-3C Orions. To provide early operational experience, the Navy bought two early model Global Hawks from the Air Force and, after modifying their sensors to provide better overwater performance, deployed one to the U.S. Central Command area in 2008 as a BAMS Demonstrator. One of the BAMS-D aircraft was lost in a crash. Cosgrove said the remaining aircraft has passed 21,000 flight hours and still is conducting operational surveillance missions. Northrop Grumman announced Feb. 17 that Triton had passed its Operational Assessment in a series of test flights conducted by Navy squadrons and the company. That cleared the way for a Milestone C procurement decision to begin production. Cosgrove said the Navy and Northrop are in negotiations to start the low-rate initial production of operational Tritons. The Navy now plans to reach initial operational capability for Triton in 2018. When the full fleet is operational, the Navy plans to station Tritons at five bases: NAS Whidbey Island, Wash.; Anderson Air Force Base, Guam; an East Coast location; somewhere in the Mediterranean; and in the Middle East, Cosgrove said.